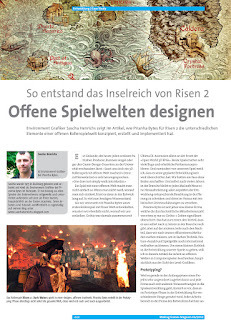 sry, this article is only in german. i wrote it a month ago. perhaps some day i will translate it. schöner Artikel. Ist immer wieder interessant mal ein paar derartige Einblicke zu bekommen. Wenn ich das richtig verstande habe, wurde das Terrain (und damit auch die Heightmap) komplett im eigenen Editor erstellt? danke oliver, ja das terrain machen wir auch im eigenen editor. Es ist cool. Eine Ausgezeichnete Artikel.Gute Arbeit Sascha! I would very much like it translated. Online translation software doesnt seem to do you justice. Open world is very important to me, and despite some recent releases, i really like its a dying art. Particularly the balance between openess and director control. Too much control makes me feel confined and in a too linear game, not enough and I feel like i dont really impact the world, or nothing amazing happens to me. eubankjosh, thank you for your interest. unfortunately it is just too much for me to translate. so i fear you have to rely on the internet translation, which must be awful ;). so sry man. perhaps one day i'll write an article in english about it.